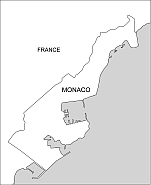 Editable royalty-free map of Monaco in vector-graphic online store. A TINY COUNTRY ON THE Mediterranean coast, Monaco lies close to the Italian border. The heart of the country is the sophisticated city of Monte-Carlo, Monaco is an independent principality, ruled for more than 700 years by the Grimaldi family. 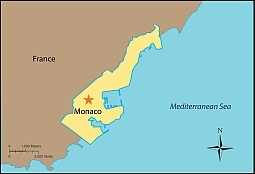 Only a small part of the population is originally from Monaco; more than half the people are citizens of France.